TOKYO, Japan, August 19, 2011 (ENS) – Japan is poised to raise automotive fuel economy standards 24 percent by fiscal 2020. A draft version of the new standards written by two government agencies was released for public comment today. The new standards being drafted by the the Ministry of Economy, Trade and Industry and the Transport Ministry specify efficiency targets for each individual type of motor, the Nikkei business daily reported. If the proposed standards are adopted, Japan would join the United States and Europe in setting fuel economy targets as an average across an automaker’s entire fleet. Japan’s national standard will likely be increased to a fleet average of 20.3 kilometers per liter of fuel by 2020, as compared with the current standard of 16.3 kilometers per liter. Hybrids like Toyota’s Prius would come under the guidelines, while electric cars and plug-in hybrids would be excluded from the requirements. The new standards are intended to force the reduction of greenhouse gas emissions to a new low and motivate the auto industry to develop new and better designs. Japanese vehicles could become more competitive around the world as other countries tighten their own fuel efficiency standards. On August 2, the Obama administration and 13 automakers agreed to boost the fuel economy of cars and light-duty trucks sold in the United States to 54.5 miles per gallon by 2025 from the current 27 miles per gallon. While Japanese and American carmakers once sought to block even small increases in government fuel efficiency standards, they have allowed this round of requirements without protest. A week later, President Obama announced the first national fuel efficiency and greenhouse gas emissions standards for medium and heavy duty trucks and buses. The Canadian government has said it will “harmonize” with the U.S. on the medium and heavy trucks standards and also with the fuel economy standards for light duty vehicles the Obama administration announced this year. The Japan Automobile Manufacturers Association said in a report in February that “a fascinating new form of competition seems to be brewing” to see who can manufacture the most fuel efficient car. The Toyota Prius, a compact hybrid vehicle, achieved the top rating of 89 mpg in Japan’s 10-15 mode test cycle. 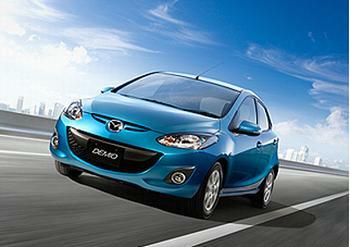 Now Japan’s automakers are striving to develop gasoline-fueled subcompacts that come close. The petrol-powered Honda Fit chalks up a fuel efficiency rating of 58 mpg and the Nissan Micra/March returns 61 mpg in Japan’s test cycle. The Daihatsu Move, with its tiny 0.66-liter engine, earned a 64 mpg rating. Mazda’s new SkyActiv-G-equipped Demio, introduced in June, achieved a rating of 71 mpg, or 30 kilometers on a single liter of petrol, which puts it on top in Japan’s fuel efficiency race. Now Automakers must look to a new, even higher standard – 24 percent higher.